On October 1, 1733, Ann Palmer left the Captain Thompson Phillips House on King Street (now Middle Street) in Plymouth, Massachusetts under distressing circumstances. A spinster, she had rented rooms and resided there for about a year with several other tenants. The others had already moved out, allegedly due to the fact that the house was haunted. She was the last of them to go, leaving empty and forlorn what had been, up until a few years prior, the most elegant house on the street. Later that night, Jane Crandon, who lived just around the corner in plain sight of the Phillips House, spotted a strange light coming from what had been one of Ann Palmer’s rooms. Crandon ran to the house to determine herself whether there was anyone inside but soon realized the house was empty and the light was gone. I have recently read of the story of the Capt. 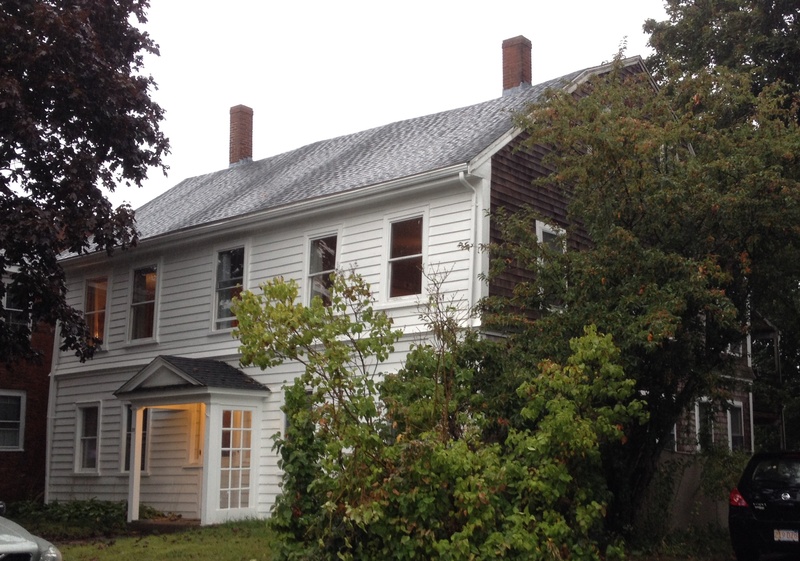 Phillips House—the alleged haunting and the court case revolving around it—in the outstanding paper by Douglas L. Winiarski, “‘Pale Blewish Lights’ and a Dead Man’s Groan: Tales of the Supernatural from Eighteenth-Century Plymouth, Massachusetts” (William and Mary Quarterly, October 1998, 497-530). It is quite a tale and I will offer a brief synopsis here. My information is taken entirely Winiarski’s paper. He uncovered an amazing historical episode that is (as far as I know) entirely left out of local history books. I will focus on the narrative. However I should point out that Winiarski’s well-supported thesis is that a broad spectrum of beliefs concerning the supernatural still existed well into the Age of Enlightenment. There was no black and white division, as is often depicted, between “enlightened” individuals and the supposed poor, uneducated country folk on the fringes of society who clung to belief in “wonders.” A great number of Plymoutheans of all walks of life seemed fully prepared to believe in the haunting of the Capt. Phillips House. In short, the episode demonstrates that there was no neat transition from a superstitious age to an Enlightened one–it was a long, complex process. Capt. Thompson Phillips, descended from a Connecticut family, moved to Plymouth from Jamaica in the early 1720s. He married Hannah Cotton in 1725, daughter of Josiah Cotton, a prominent man in Plymouth. Josiah Cotton (1679-1756) was Harvard educated, served a brief time as a minister, then as a schoolteacher, a Justice of the Court of Commons Pleas in Plymouth, a clerk of the same court, and Registrar of Deeds among other civic offices. He also wrote on a variety of subjects including history and theology. Hannah Cotton Phillips bore one daughter, also named Hannah, and the small family lived in the handsome house that Capt. Phillips built about 1725. The captain, of course, was at sea much of the time, and on December 6, 1729, he was washed off the deck of his ship and drowned. Hannah soon married another mariner and moved to Boston with her daughter and new husband. A year after her second marriage, Hannah Cotton Phillips contracted smallpox and died. Little Hannah Phillips was entrusted to the care of her grandfather in Plymouth, Josiah Cotton. He also took on responsibility for dealing with the house in Plymouth that would, in theory, become Hannah’s inheritance. The house had already been rented to several tenants: John Clark, a joiner, and his family; Samuel Holmes and his family; and the spinster Ann Palmer. Cotton felt that selling the house would be more profitable and tried, but no one would buy. And so he continued to rent. In April 1733, Cotton informed John Clark that intended to fit another tenant into the house and that Clark would have to give up one of the rooms he rented. The joiner did not take well to this notion. Clark threatened his landlord that he would spread rumors about the house. He said that his wife had heard things that terrified her. He claimed that the house was haunted, “in the worst sense of the word.” Some believed it was the ghost of the drowned Capt. Phillips. Cotton was not deterred and so Clark made good on his threat. He began to tell his friends throughout the town about the alleged haunting. He said he had seen a light “plain as the light of a candle” in one of the garret windows…a space he knew to be unoccupied at the time. Clark alleged that residents of the house had heard “a great noise like the banging of a door to and fro.” “There was something extraordinary” about the house, Clark asserted. Inexplicable groans that sounded like someone in a “dying posture.” The sound of canes rapping against the walls. Doors, cabinets and drawers would fly open. One night, a neighbor, Mary Little, spied a “pale blewish light” in the garret window and feared it was a fire. She watched it for about a half an hour until it disappeared. By the summer of 1733, with all these rumors making their way around town, the “grate part of the Town” gathered nightly outside the windows of the Capt. Phillips House hoping to see the lights for themselves. Apparently the ghost of Capt. Phillips did not oblige the crowds. Still, neighbors were terrified of the place. On July 23, 1733, the Clarks and the Saverys moved out of the house. Clark said that he “could not live no longer in Mr. Phillips house…because of such unusuall noise in the house…he nor no body allse could live in it because it was haunted with evill spirits.” The last tenant, Ann Palmer, left on October 1. And then the house sat empty. The tenants defaulted on their rent and Cotton could not manage to convince anyone else to rent it. An advertisement he posted outside the local tavern was torn down. In February 1734, Josiah Cotton and John Cushing, Jr. (the executor of the Phillips estate) brought action against Clark and Savery alleging that they had “done us damage by telling stories there was no just reason for.” They wanted £200 for their losses. It was during this sensational trial that the above quotes came out describing what had been going on in the house–testimony from residents and neighbors alike. The trial began on March 5, 1734. After much testimony and excitement, the defendants were acquitted. Cotton and Cushing appealed. During the appeal, the defense attorney, John Otis, argued that conspiracy among so many individuals was impossible. The Superior Court agreed and upheld the decision. With this, Cotton and Cushing relented. Unable to sell or rent the Capt. Phillips House, Cotton decided to move into it with his family on March 29, 1734. The Cottons never saw or heard any ghosts. It took some time, but the excitement and rumors eventually dissipated. In November 1739, Cotton managed to rent the house and he moved back to his North Plymouth farm. It must have been quite an ordeal for him, first and most significantly losing his daughter, and then having to deal with financial and legal strife. The whole episode, from my perspective, has echoes of the Salem Witch Trials. Individuals motivated by financial and/or political issues alleging supernatural phenomena in order to win the upper hand. But you can read about that in an older entry. As mentioned above, this fascinating tale was all but lost to history before Winiarski shed light on it. There is very little local folklore or oral tradition persisting about the house–none that I’ve ever heard, anyway. A number of years ago, I lived behind the Capt. Phillips House on the next street over. Never once saw a pale “blewish” light though.